To Cite: Jahanbani E, Nasiripour A A, Raeissi P, Tabibi S J. Developing a Model for Agility in Health Humanitarian Supply Chains Using Factor Analysis: Evidence From Iran, Jundishapur J Health Sci. 2014 ; 6(4):e24270. doi: 10.5812/jjhs.24270. Background: Since 2000, increase in frequency and severity of natural disasters has necessitate designing an agile relief supply chain to help to affected people. Objectives: This study aimed to develop an agile model for supply chains with emphasis on health services in Iranian relief organizations. Materials and Methods: This was a descriptive-comparative study. In order to design the conceptual model, agility patterns of supply chains were reviewed in a comparative study. Moreover, a questionnaire was prepared to examine construct (model) validation. The validity of questionnaire was confirmed by the judgment of experts and its reliability was ensured by test-retest method with scale of 0.99, and Cronbach's alpha of 0.98. All data were analyzed through factor analyses by SPSS 16 and LISREL 8.53. Results: Responsiveness, effectiveness, and flexibility with eigenvalue of 2.628 were identified as the main aspects of agility in humanitarian health supply chains. The components of visibility, reactivity, and speed were identified as components of responsiveness. Quality, reliability, and completeness were identified as components of effectiveness. Volume, delivery, mix, and product were known as components of flexibility. Conclusions: Findings confirmed agility dimensions and relationships between them in a model that can be considered as a comprehensive and appropriate model in the establishment, promotion, and evaluation of relief supply chains by policy-makers and authorities of Red Crescent Society and Medical Emergencies. Frequency and severity of natural disasters have increased since 2000 (1) and it is expected that in the next 50 years, increase by five times (2, 3). Natural disasters do not only appear in developing countries. Tsunami in South Asia in 2004, Hurricane Katrina in 2005, and the earthquake in Pakistan in 2005 as well as Java in 2006 are just a few examples of deadliest accidents in the past few years (2). These indicate need to design relief supply chain to provide the affected people with the required material (food, water, medicine, shelter, etc.) rapidly and get supplies to destroyed areas in order to decrease human losses and economic damages (1). Different studies have revealed that nearly 80% of the relief efforts are related to logistics and supply chains (4-6). The main purpose of a disaster supply chain is to deliver the right products and goods to the right place, to the right people, and at the right time (7). In fact, the ability to respond quickly and appropriately to the changes is a vital matter for relief supply chains (RSCs), but this subject is rarely analyzed and is poorly understood (8). Oloruntoba et al. stated that although there was little information about the logistics of the relief (9), using techniques of business supply chain management might solve this problem (8, 10). One of the concepts, with about two decades of development, is agility (11). In this new paradigm, organization is able to obtain the ability to success in ever-changing and unpredictable environment. In fact, agility is the paradigm of increase flexibility, speed, and quality (12). Agility in the supply chain is defined as the ability to respond to the unpredictable changes (7). Lee believes that the main objective of an agile supply chain is a quick response to the short-term changes in supply and demand as well as gently control of the inconsistencies (13). Disaster supply chains is one of the environments that needs agility due to the high degree of uncertainty that must be dealt with as well as the complexities that result from high levels of stress and uncertainty (7). According to Christopher, the original essence of the disaster management is swiftness and agility should be the heart of humanitarian logistics, where there is a huge potential for improvement and significant benefits for those who are affected by these activities. It should be noted that in the application of this paradigm, the relief operation is different from other operations because of its very variable, special, and unique modes, which are often met with limited resources and infrastructures (10). Other feature is associated with several organizations trying to perform their operations with each other simultaneously (14, 15). In addition, relief organizations have the unreliable financial nature, their employees have no formal training and are constantly moving, and the operation of these organizations is based on poorly defined processes and unrelated technologies (6). Therefore, to make derived models and data from business organizations applicable, they should be adapted to RSCs and logistics processes (8). According to above statements and lack of academic research in the field of humanitarian supply chains (HSCs) (11-13, 16-19), the researchers decided to design agility model in RCCs to improve the basic concepts and insights of agile paradigm and help to establish and evaluating agility in RSCs, especially in health sector. In a descriptive-comparative study an agility model for the health humanitarian supply chain in Iran was designed, and verified using factor analysis. The study was conducted in seven steps. First, agility models of supply chains were reviewed in a comparative study. Second, the dimensions and components were obtained in accordance with RSCs and data on these factors were collected. Third, based on the collected data and the conditions of the RSC, the theoretical model was designed. In fourth stage, a questionnaire was prepared after considering dimensions and components of each patterns, experiences of relief organizations, especially the International Red Crescent, and consulting with authorities and experts of Iran relief organizations. Then 138 professionals in the field of health services management and disaster management, and managers of Red Crescent Societies and Medical Emergency Centers across the country were selected by snowball sampling and were requested to complete the questionnaire. In fifth stage, after completing questionnaires by experts, exploratory factor analysis (EFA) was used to identify the underlying or latent factors for the set of observed variables or items. 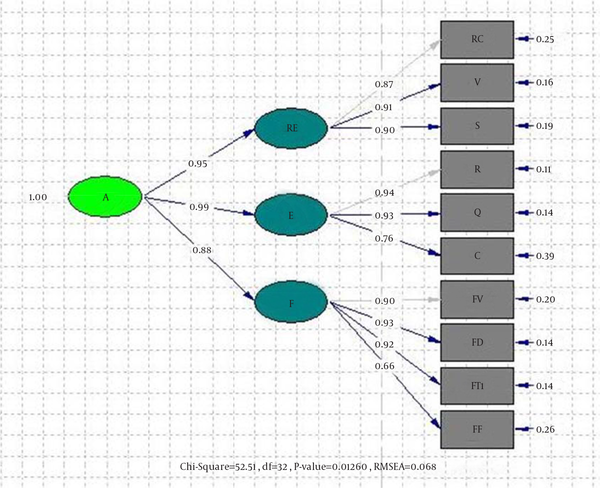 In sixth stage, confirmatory factor analysis (CFA) was used to confirm the identified factor structure in EFA. In seventh stage, final model was approved using fit indices. We should mention that EFA and CFA are two types of analyses that fall under the structural equation modeling (SEM) family. EFA is often considered a data-driven approach for identifying a smaller number of underlying factors or latent variables. CFA is used as a second step to examine whether the identified structure in the EFA works in a new sample. In other words, CFA can be used to confirm the identified factor structure in the EFA. Unlike EFA, CFA requires pre-specification of all aspects of the tested model and is more theory-driven than data-driven. If a new measure is being developed with a very strong theoretical framework, it is possible to go directly to the CFA (23). In comparative study phase, sample size was not relevant and 11 models were used as sources of information. In the field study phase, sample size was calculated on basis of results of the pilot study (n = 138). According to the study phases, data collection tools consisted of fish card, to collect online and library information, and questionnaire for giving up of professionals. The questionnaire contained 49 questions, with separated relevant components, about the items (observed variables) that affect the agility of HHSCs. The questionnaire was scored with a five-score Likert scale ranging from too great (five) to very low (one). To assess the validity of the questionnaire, the expert judgment method was used. The reliability of the questionnaire was ensured by test-retest method with scale of 0.99, and the coefficient of internal consistency with Cronbach's alpha of 0.98. The adequacy of the sample size was determined by the method of Kaiser-Meyer-Olkin (KMO) with the value > 0.6 and suitability of the EFA use for different aspects of questionnaire was checked through Bartlet test with a value < 0.05. Model parameters included agility factor as the main latent variable. Responsiveness, effectiveness, and flexibility were considered as slight latent variables. Moreover, visibility, reactivity, and speed with 22 items were considered as observed variables of responsiveness. Completeness, reliability, and quality with nine items were considered as observed variables of effectiveness. Delivery, volume, mix, and product with 18 items were considered as observed variables of flexibility. The data were analyzed using the SPSS 16 (SPSS INC, Chicago, IL, USA) and LISREL 8.53. The factor loadings are the regression coefficients for predicting the indicators from the latent factor and in general, loadings < 0.30 were not interpreted (23). Fit indices with the following values were used in order to fit the model: χ2/df ≤ 3, RMSEA ≤ 0.07, P value ≤ 0.05, AGFI ≥ 0.8, and GFI ≥ 0.8 (24). According to results of the comparative study, the theoretical model of agility had three main dimensions and ten components as follows: responsiveness, with three components of reactivity, visibility, and speed; effectiveness, with three components of quality, reliability, and completeness; and flexibility, with four components of volume, delivery, mix, and product (Figure 1). The results of the questionnaires, which was designed to determine the validity of the conceptual model using EFA (with varimax rotation), showed that three dimensions of responsiveness, effectiveness, and flexibility with eigenvalue of 2.628 and loadings > 0.8 are the underlying factor. This factor explains 87.6% of total variance of variables. Results of CFA also showed that effectiveness with factor loading of 0.99 had the highest correlation with the agility factor. The results of t value showed that the factor loadings were all outside the range (from -2.5 to + 2.5). It means that all defined relationships Were verified at 99% confidence level (table 1). Regarding responsiveness dimension, the results of EFA with eigenvalue of 2.58 and loadings > 0.9 indicated that responsiveness was an underlying factor for three items. These items were reactivity, visibility, and speed. This factor explained 86.11% of the total variance of variables. According to the results of CFA, correlation between responsiveness and its aspects ranged from 0.87 (RC) to 0.91 (S). These correlations suggested that they were aspects of responsiveness. Results also showed that speed, with loading of 0.91, had the highest correlation with the responsiveness factor. In addition, the results of t value showed that all the factor loadings were outside the range (from - 2.5 to + 2.5). It meant that all defined associations of model were approved at a significance level of 0.01 (Table 2). Regarding the effectiveness dimension, the results of EFA with eigenvalue 2.55 and factor loadings > 0.7 indicated that Effectiveness was an underlying factor for three items. These items were quality, reliability, and completeness. This factor explained 85.09% of the total variance of variables. According to the results of CFA, the loadings for the three variables on effectiveness ranged from 0.76 (C) to 0.94 (R). These suggested that they were aspects of Effectiveness. It also showed that component reliability with loading of 0.94 had the highest correlation with the Effectiveness factor. In addition, the results of t value showed that all the factor loadings were outside the range (from-2.5 to + 2.5). It meant that all defined relationships for model were approved at a significance level of 0.01 (Table 3). Regarding flexibility dimension, the results of EFA with eigenvalue of 3.43 and factor loadings > 0.8 indicated that flexibility was an underlying factor for four items. These items were flexibility of volume, delivery, mix, and product. This factor explains 85.84% of the total variance of variables. According to the results of CFA, loadings for the three variables on flexibility ranged from 0.85 (FP) to 0.93 (FD). These suggested that they were aspects of flexibility. Results of CFA also showed that component delivery with loading of 0.93 had the highest correlation with the flexibility factor. The results of t value showed that the factor loadings are all outside the range (from-2.5 to + 2.5). It meant that all defined relationships for model were approved at a significance level of 0.01 (Table 4). The standardized estimates output, provided by LISREL 8.53 through second-order factor analysis, is shown in Figure 2. The ovals represent latent (or unobserved) variables and the rectangles represent observed variables. The straight single-headed arrows represent the factor loadings of the observed variables on the latent variables. The loadings for the three variables on responsiveness ranged from 0.87 (RC) to 0.91 (S). The loadings for the three variables on effectiveness ranged from 0.78 (C) to 0.94 (R). The loadings for the four variables on flexibility ranged from 0.86 (FP) to 0.93 (FD). The loadings for the three slight latent variables on the main latent variable (agility) ranged from 0.88 (F) to 0.99 (E). All loadings and correlations among latent and observed variables were significant (P ≤ 0.01) and all were > 0.70. All the factor loadings were considered fair to excellent, and all indicator variables were significantly loaded on the expected latent variables. The initial agility in HHSC model fitted well, with X2 = 52.51, df = 32, and P value < 0.01. All provided fit indices by LISREL 8.53 are shown in Table 5. These fit indices suggested that the model did not need modification, because all amounts of the fitting indices (absolute and comparative) were > 0.80. Moreover, amounts X2/df and RMSEA were respectively 1.64 (< 3) and 0.068 (< 0.07). In the present study, effectiveness was identified as one of the main dimensions of agility model. This result was consistent with the results of other studies (8, 11, 17-20). Charles (8) quotes Okongwu et al. that agility in supply chain is the combination of effectiveness and accountability in a flexible environment. The obtained results revealed the effectiveness had the most important role. Cozzolino (21) believes that in HSCs, effectiveness takes care of saving time and saving time means saving lives. Perrine believes that in relief organizations unlike commercials, the effectiveness has priority on efficiency. According to PAHO, any shortage in relief supply chain, as the only source is committed to providing basic healthcare goods, can exclude specialists for saving the lives and the consequences can be ominous. Therefore, handling people in need is more valuable than providing effective services (22). 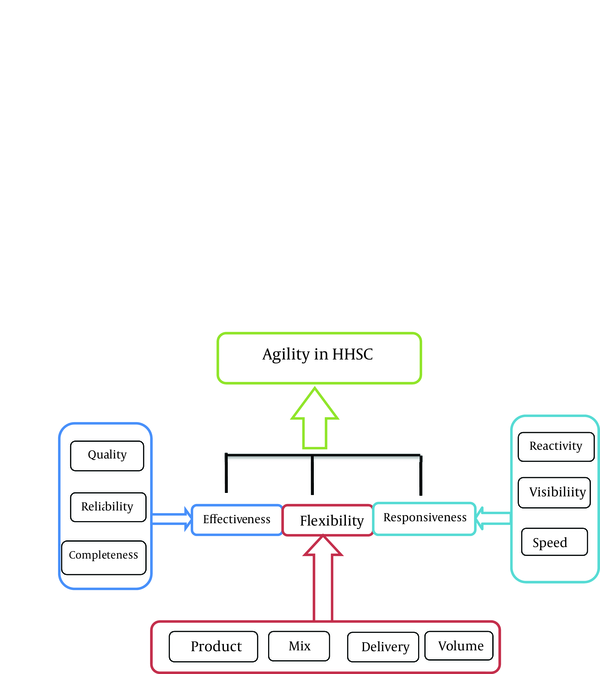 The results confirmed the effects of the above factors on agility in HHSCs. Quality, reliability, and completeness were approved as components of effectiveness. In the study conducted by Charles (8), reliability and completeness were seen as components of effectiveness. With regard to the importance of reliability as the most important component of the effectiveness, Mcguire believes that before doing any action to reduce the time, the reliability of goods and services should be checked (23). Regarding the importance of quality components in the RSCs, World Health Organization states that the primary objective of relief organizations is reduction of the suffering, which needs high quality of health products. Low-quality goods use valuable resources but barely are effective in the prevention of epidemic and reduction of mortalities and morbidities (23). Outlined requirements in Sphere project (24) and PAHO (22), e.g., preparation and registration of a variety of details such as amount, time, and place of distribution, implies the effect of completeness on agility in HHSCs. Responsiveness is identified and confirmed as another main dimension of agility. This result were consistent with the results of other studies (8, 17, 20, 25). Based on the comments of Yusuf et al. (26), responsiveness is the most important ability of an agile supply chain. Responsiveness defined as one of the main abilities of an agile supply chain (8). Kisperska-Moron and Swierczek (27) were convinced that agility, most of all, is in connection to respond to customers, people, information, and cooperation with and between companies. McGuire quotes UNHCR and Hanquet: "Volatility of demand, extent, and kind of relief item is needed to a flexible and responsive logistics services." Mcguire argued that frequent changes in relief demands were needed for a responsive and resilient supply network (23). Identifying speed as a component of agility showed consistency with the results of other studies (8, 11, 17-20, 28-31). Costa et al. in definition of agility referred to speed as "the ability to accelerate activities in the critical path" (32). According to Christopher and Towill (33) speed is "the ability to complete the work as quickly as possible". In researches that were related to supply chain agility, this ability was always regarded as an enabler. Gligor believes when a decision on "how to respond to change" is made, organizations must be able to do fast (17). Visibility was discussed as an agility enabler in models of Christopher and Towill (33), Lin et al. (19), and Tseng and Lin (20); however, it was considered as a success factor of agility in models of Azar (30), Kazazi and Sohrabi (11), and Zarenezhada et al. (18) and as one of the main and independent aspects of agility in Gligor model (17). Charles believes the complexity, which was caused by the uncertainty and the multiplicity of the factors in relief environments, makes the decision on the appropriate reaction difficult (8). Therefore, Learning from commercial experiences in this domain is a priority. Reactivity was identified as another component of responsiveness dimension. Concerning the identification of flexibility as the third dimension of agility, the findings of this study were consistent with studied patterns (8, 11, 17-20, 30, 31, 34, 35). Based on Christopher and Towill (33), flexibility is the key feature of an agile organization. Swafford et al. (35) identified the agility as the outer ability caused by flexibility of the supply chain process and while researching on four areas of procurement, manufacturing, distribution, and logistics, they reported that the flexibility was certainly effective in agility of the supply chain. Tachizawa quotes Prater: “agility of the supply chain has two main components: speed and flexibility. Speed is the time required to transport or receive goods, while flexibility is a degree that company can regulate its speed, distance, and volume.” Charles (8) states that the flexibility is an obligation that a supply chain needs to achieve agility. Razmi and Sayfouri (36) believed that the agility and speed are needed for a flexible manufacturing system, staff knowledge, and structure of management to encourage team innovations. Jafarnezhad and Darvish stated that many researchers had considered the agility as the expansion of flexibility (25). Delivery flexibility drew attention in other studied models (11, 18, 30, 31, 34, 35). regarding the importance of delivery flexibility, the International Red Cross believes that reduced suffering and return to normal conditions after a disaster relies on the rapid delivery of goods (37). Because of damage to roads or for security reasons, the relief team is forced to use other modes of transportation; therefore, the relief organizations need to change the shipping mode. On the other hand, healthcare goods have characteristics that mandate different modes of transport. For example, goods that are sensitive to heat and humidity or have a limited life shelf require faster means of transport. Moreover, susceptibility to physical damage such as breakage slows transport by aircraft or small vehicles (23). Another component of the flexibility dimension was volume flexibility. In Charles’ Model (8) flexibility had four components, namely, volume, delivery, mix, and products, that were consistent with current research. In Zarenezhada et al. model (18), flexible size by flexible warehouse space was regarded as one of the success factors. Mcguire (23) states that the extent, severity, and type of crisis have a great effect on the decrease or increase in the volume and type of goods and services. Moreover, seasonal diseases and changes in the standard protocols might cause an increase or decrease of some pharmaceutical items demand. The flexibility of the type of products (mix), as another component of the flexibility, was considered in the other studied models (8, 11, 17, 18, 30, 34, 35). Required goods and services are different by the type of disaster and affected people. Thus, mix flexibility is an essential component in HSCs (23). Product flexibility, as other component of the flexibility, had the lowest correlation with the agility. regarding importance of this component in disaster, Charles stated that each crisis is unique and might need specified items, which are not even in emergency items catalogue (8). Finally, in this study, the concept of supply chain agility, offering practical solutions, and enabling deployment and measurement of agility were defined. In fact, this research provided the agility pattern in RSCs as a framework to predict and identify factors affecting the agility of these chains. This model was developed by scientific studies and opinion of academic professionals and executives. Therefore, it can be considered as a comprehensive approach and efficient tool for agility in RSCs by policymakers and authorities of Red Crescent and Medical Emergencies. In summary, we believe that although the model was developed according to a review of literature pertaining to the subject, EFA, and CFA, it is necessary to validate its practical applicability with another sample. According to moderate sample size (138), the findings should be interpreted cautiously and not be taken as an indication of problems or limitations. We express our thanks to the professionals, managers, and experts of disasters in medical science universities, Red Crescent Societies, and Emergency Medical Services Centers throughout the country for their participations in this study. 22. Humanitarian supply management in logistic in the health sector.